Over 100 volunteers and advocates from all over the state gathered together at the Nebraska State Capitol today in support of increasing taxes on tobacco products. 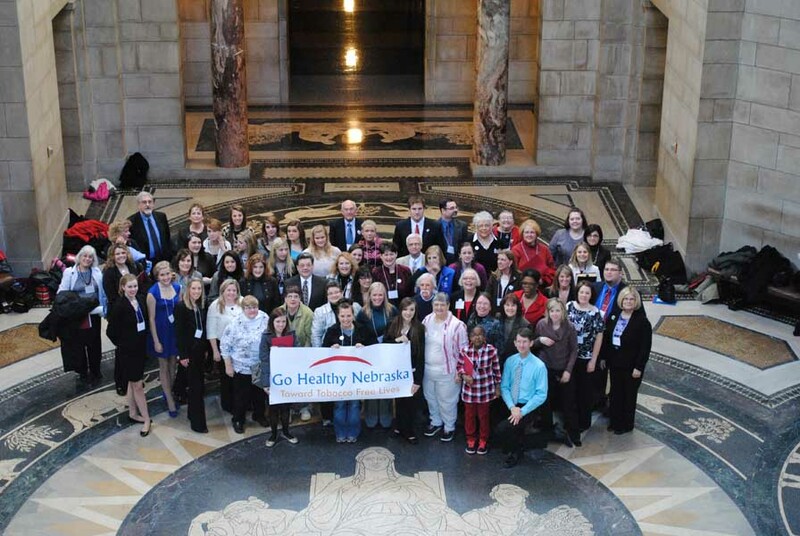 Representatives from diverse groups such as the American Cancer Society, the American Heart Association, the American Lung Association, the Nebraska Medical Association, the Campaign for Tobacco Free Kids, AARP, and numerous others gathered for a breakfast at the Cornhusker Hotel before moving on to the Capitol to meet with their respective Senators. In Nebraska, 2,200 kids under 18 become new daily smokers each year while the same amount of adults die prematurely each year in Nebraska from smoking. In addition, tobacco use costs Nebraska $537 million in health care bills each year. Higher cigarette taxes are one of the most effective ways to reduce smoking among both youth and adults and new revenue created by the increase would go to fund health programs including tobacco prevention and cessation in addition to helping with the state budget deficit. Groups such as the American Cancer Society, American Heart Association, American Lung Association, and the Campaign for Tobacco-Free Kids support higher tobacco taxes because it is a proven solution to improve public health. Research has shown that every state that has significantly increased its cigarette tax has enjoyed substantial increases in revenue, even while reducing smoking. In a recent poll, 73 percent of Nebraska voters surveyed support raising the tobacco tax by $1.35 per pack. On June 23rd the American Cancer Society Cancer Action Network (ACS CAN) began a new battle to end breast cancer through a campaign called Plant It Pink. A kickoff event was held at Finke Gardens and Nursery in Lincoln at 10:30 this morning featuring four speakers who talked about the importance of breast cancer awareness and impact that ACS CAN has for those battling the disease. Through the Plant It Pink campaign, local volunteers hope to distribute Pink Impression tulip bulbs all around Nebraska during Breast Cancer Awareness Month in October to honor those battling the disease by selling memberships to ACS CAN. In exchange for signing up at the $20 level, people will receive a box of 10 tulips that can be picked up and planted in the fall. The Plant It Pink campaign supports ACS CAN, the non-profit, non-partisan advocacy affiliate of the American Cancer Society. ACS CAN works to promote state and federal initiatives such as the National Breast and Cervical Cancer Early Detection Program, which helps deliver lifesaving cancer tests to those who cannot afford them. Running June 23 until July 23, people who pay $20 for an ACS CAN membership will receive 10 Darwin hybrid tulips imported from Holland. The bulbs will be available for pick-up and planting in early October. Also speaking at today’s event were LuAnn Finke, owner of Finke Gardens and Nursery, sponsor of the 2010 Plant It Pink campaign, Mary Foerster, breast cancer survivor and ACS volunteer and David Holmquist, ACS Director of Legislative Government Relations. To make a donation to ACS CAN and receive your Plant It Pink impression tulips, visit www.acscan.org/nebraskaplantitpink or contact Dave Holmquist at 402-393-5801. The bulbs will be available for pick-up at Finke Gardens and Nursery on Oct. 12. Contributions or gifts to ACS CAN are not tax deductible. ABC News veteran Sam Donaldson headlined the Star of Hope Breakfast, an American Cancer Society Cancer Action Network fundraiser, at the LaVista Conference Center this morning. Donaldson was diagnosed with melanoma cancer in 1995 and has been an avid supporter of cancer research. The event was a fundraiser for the American Cancer Society Cancer Action Network (ACS CAN), a nonprofit, nonpartisan sister advocacy organization of the American Cancer Society, which is dedicated to eliminating cancer as a major health problem. ACS CAN works to encourage lawmakers, candidates and government officials to support laws and policies that will make cancer a top national priority. Rob McCartney and Brandi Petersen, co-anchors for KETV in Omaha were the emcees for this morning’s event. American Cancer Society Board of Directors President Charlotte Burke of Lincoln made remarks followed by Omaha Mayor Jim Suttle’s presentation of the key to the city for Mr. Donaldson. Following his remarks of 20 minutes, Donaldson fielded a few questions from the audience and received gifts from the City of LaVista as well as the Star of Hope Award from the American Cancer Society. In all, more than 250 attended this morning’s event.